1259873439 -The Annual Editions series is designed to provide convenient inexpensive access to a wide range of current articles from some of the most respected magazines, newspapers and journals published today. Annual Editions are updated on a regular basis through a continuous monitoring of over 300 periodical sources. The articles selected are authored by prominent scholars, researchers, and commentators writing for a general audience. Each Annual Editions volume has a number of features designed to make them especially valuable for classroom use; including a brief overview for each unit, as well as Learning Outcomes, Critical Thinking questions, and Internet References to accompany each article. Go to the McGraw-Hill Create® Annual Editions Article Collection at http://www.mcgrawhillcreate.com/annualeditions to browse the entire collection. 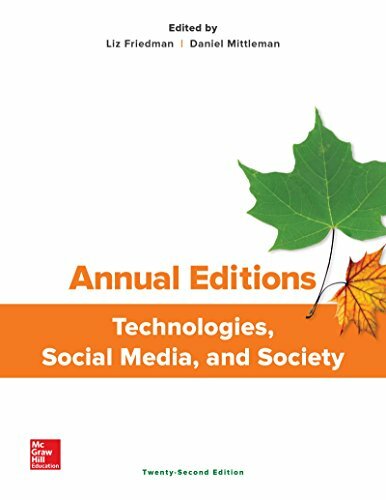 Select individual Annual Editions articles to enhance your course, or access and select the entire Friedman/Mittleman: Annual Editions: Technologies, Social Media, and Society, 22/e book here http://create.mheducation.com/createonline/index.html#qlink=search%2Ftext%3Disbn:1259873439 for an easy, pre-built teaching resource. Visit http://create.mheducation.com for more information on other McGraw-Hill titles and special collections.